Dolores Huerta is co-founder of the United Farm Workers of America and a longtime board member of People For the American Way. 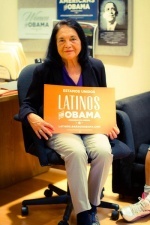 She was the long time partner of the late Richard Chavez, brother of United Farm Workers founder Cesar Chavez. Dolores Huerta was long the vice-president of the UFW and its chief negotiator of contracts, as well as the primary advocate for farm worker rights in the California legislature. She is the president of the Dolores Huerta Foundation, a 501(c)(3) “non-profit organization whose mission is to build active communities working for fair and equal access to health care, housing, education, jobs, civic participation and economic resources for disadvantaged communities with an emphasis on women and youth.” The foundation was started with funds received from a settlement after she was assaulted and severely injured by police at a 1988 anti-war demonstration in San Francisco and beaten so severely her spleen had to be removed. 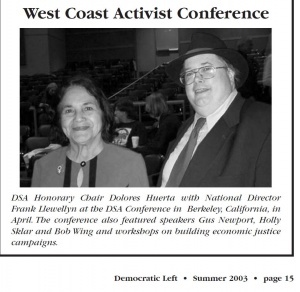 Huerta was reruited into the Democratic Socialist Organizing Committee by founder and chairman Michael Harrington. The organizations listed below are various fronts of the Communist Party USA CPUSA, the Socialist Workers Party SWP or the Workers World Party. Many have been exposed in congressional hearings, studies and reports placed in the Congressional Record CR, or in various books, studies, and newspaper articles published since 1967. PCPJ was the Communist Party's faction in the old New Mobilization Committee while NPAC was controlled by the Socialist Workers Party Trotskyites. PCPJ was formed out of the Milwaukee Strategy Action Conference of June 27-28, 1970, also reported on in this same HISC hearing, Part 1. NB: Terence Hallinan was identified as a leading member of the CPUSA front, the W.E.B. DuBois Clubs of America and of the Communist Party USA. He also was known as "KO" Hallinan, in part because he was a former boxer and in part because he beat up or threatened to beat up people who disagreed with him, as happened at this Oct. 11, 1969 meeting, p. 1642. He was also known by the nickname "Dynamite Hallinan", most likely more for his temper than his boxing skills. "Join with the thousands of us who will be standing side by side in a circle around Congress. We stand in spirit with the Indochinese, and demand an immediate cutting off of the funds which perpetuate their slaughter, make victims of young American men, and deny the needs of our poor people at home." While some of the sponsors were not communists, a good part of the Hanoi Lobby was represented including Bella Abzug, Barbara Bick, Anne Braden, Kay Camp, Ruth Gage-Colby, Ruby Dee, Jane Fonda, Libby Frank, Sylvia Kushner, Ruth Myers, Louise Peck, Vivian Raineri, Rosalie Riechman, Beulah Sanders, Dorothy Steffens, Amy Swerdlow, Edith Villagstrigo, Dorothy Hayes, Ethel Taylor, and Cora Weiss. Members of WSP included Abzug, Bick (id. CPUSA), Myers (id. CPUSA), Villastrigo, Taylor, and Weiss (daughter of id. CPUSA member and possible Soviet agent of influence Samuel Rubin. Members of the CPUSA-influences and partially dominated Women's International League for Peace and Freedom included Libby Frank a CPUSA and Committees of Correspondence member), Riechman, and Steffens. Identified CPUSA members included Bick, Braden, Kushner, Myers, Rainieri . The information on other CPUSA members has not been made public. Marxists and spouses/children of avowed marxists included: Dee, Friedan (reportedly a one-time member of the CPUSA and its labor unions), Tina Hobson (wife of Julius Hobson), Jeanie Palmondon, Louise Peck (wife of (Sidney Peck, a former CPUSA member), and Roslyn Zinn, among others. From May 11-12, 1973, the Communist Party USA CPUSA created a new front out of the old Angela Davis Defense Organization and Angela Davis Defense Committees. It was called the National Alliance Against Racist and Political Repression. 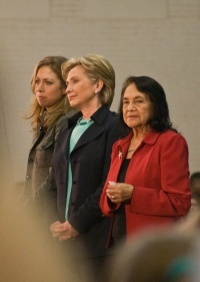 Dolores Huerta was both a sponsor and speaker at this conference, and was identified as Vice President, United Farmworkers Union . This information came from conference press releases, lists of participants, and summary report about it, all of which are found in a House Internal Security Committee hearing. 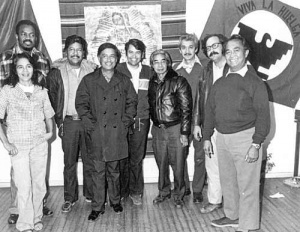 Huerta was an equal-opportunity endorse, sponsor and speaker for several American communist/marxist/trotskyite parties including the Socialist Workers Party SWP. One such example occurred at an October 12, 1973 rally at Columbia University to "to express solidarity with the thousands of political prisoners who have been tortured and murdered by the Chilean junta since the Sept. 11 coup. The U.S. Committee for Justice to Latin American Political Prisoners USLA organized the meeting." The USLA was described as an SWP front in "Trotskyite Terrorist International", Hearings, SISS, July 24, 1975, pp. 66-67, with letterhead of staff and endorsers (some of who will be found in the "Visitors to North Vietnam/Hanoi During the War" KW page). Public mention of Huerta and her UFWU (United Farm Workers Union as both a sponsor and speaker was found in the SWP weekly newspaper The Militant, October 19, 1973, p. 5, "National Action Week Hits Chile Repression" by SWP member Caroline Lund. A few excerpted paragraphs explain who was sponsoring the event and some of whom were endorsing it and participating in it. "The actions are being organized by a number of organizations, primarily the U.S. Committee for Justice to Latin American Political Prisoners USLA, the Chile Solidarity Committee ChileSC (a significantly CPUSA influenced organization if not creation), Non-Intervention in Chile NICH (which had a lot of SDS members influence), and the North American Congress on Latin America NACLA, (an SDS creation)." "A broad, united protest rally is scheduled in New York for Oct. 12. Initiated by USLA, the rally has the backing of the United Farm Workers Union; the Joint Board of the Fur, Leather and Machine Workers Union (controlled by the CPUSA); Carlos Feliciano Defense Committee (a defense group for the terrorists of the Puerto Rican Socialist Party PRSP); the Latin American Student Organization at Columbia University; Black Panther Party BPP; former Senator Eugene McCarthy; Joan Baez; Betty Friedman; Socialist Workers Party; International Socialists; and many others." "Speakers are to include several eyewitnesses of the repression in Chile; Dolores Huerta of the Farmer Workers; Dr. Benjamin Spock; and other trade unionists and movement figures..."
In the October 26, 1973 issue of The Militant, a report was published about the Oct. 12th demonstration at Columbia University, "1300 at NYC rally demand justice for victims of brutal terror in Chile", by SWP leader Cindy Jacquith. "While defense of the junta's victims was the central theme of the rally, speakers expressed a wide range of views on the lessons that can be drawn from the Chilean experience." "Black attornery Conrad Lynn and United Farm Workers UFW Vice-President Dolores Huerta both pointed to the serious defeat for the left that the coup represents. Lynn called it a "tragedy," likening it to "the crushing of the Spanish loyalists in the 1930's"." "Huerta told the audience she grieved "for all the Latinos slain in Chile." She said the coup "is such a terrible, horrible thing that it is almost hard to speak about."". A picture of Huerta at the speaker's podium appeared on the right side of the article with the caption: "Huerta: Express solidarity with those slain by the junta". P. 15. Survival Fest 84, "Survival Day 84" speakers included Dolores Huerta, United Farm Workers. At the 1987 National Rainbow convention in Raleigh North Carolina, a new board was elected, which included Dolores Huerta. Every year since the mid 1960s the Indiana based Eugene V. Debs Foundation holds Eugene Debs Award Banquet in Terre Haute, to honor an approved social or labor activist. The 1993 honoree, was Dolores Huerta. 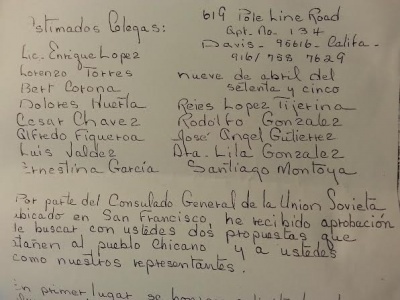 The organization posted a list of significant “Chicano movement” activists on its website which included Dolores Huerta, a member of the United Farm Workers. With Maxine Waters, Mabel Teng, Betty Parent, Art Torres, Dolores Huerta. At the parties, Huerta joined local elected officials and residents to phone bank area voters in support of Clinton. Holiday party goers took to the streets and went door-to-door and to local shopping centers to talk to voters. "We're traveling throughout the state to deliver the message from Hillary Clinton that when she's in the White House, no American will be invisible to her," said Dolores Huerta. "As President, Hillary will ensure we have universal health care, affordable housing, quality education and the opportunity to achieve the American dream." The "Holiday Parties for Hillary" was also the launch of the Clinton Campaign's new and ongoing voter contact effort known as Bring-Your-Own-Phone parties. The BYOP parties allow supporters to use their personal phones to come together and make hundreds of calls to area residents in support of Hillary Clinton. Los Angeles, CA – May 17, 2016, Hillary for California announced that Dolores Huerta and Eliseo Medina will join the campaign team as senior advisors. Huerta and Medina will build on the campaign’s robust outreach to the Latino community in California and work with the campaign’s senior team to organize and engage Californians in conversations about Hillary Clinton's plans to break down barriers and help move the country forward. 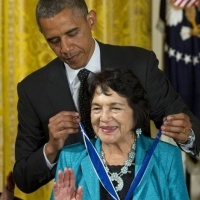 On April 27, 2012 President Barack Obama named Dolores Huerta as one of the thirteen new recipients of the Presidential Medal of Freedom. The Medal of Freedom is the nation’s highest civilian honor, presented to individuals who have made especially meritorious contributions to the security or national interests of the United States, to world peace, or to cultural or other significant public or private endeavors. President Obama said, "These extraordinary honorees come from different backgrounds and different walks of life, but each of them has made a lasting contribution to the life of our nation. They’ve challenged us, they’ve inspired us, and they've made the world a better place. I look forward to recognizing them with this award." Senator Ted Lieu, Dolores Huerta and Assemblymember Steven Bradford - 2013 Equality California Awards Gala_Inside Held at JW Marriott Los Angeles - LA Live - Los Angeles, California, United States - Sunday 6th October 2013. The Cuban 5 should be released and returned to their families, declared a resolution passed unanimously by the Coalition of Labor Union Women at its national convention in November 2013. In June 2014, dozen activists with the group 99Rise marched from Los Angeles to Sacramento to protest the "corrupting influence of big money in politics." "They will arrive at the Capitol on Sunday at 2 p.m., where they will be joined by supporters, including Sen. Ted Lieu, D-Torrance, activist Dolores Huerta and recent Secretary of State candidate Derek Cressman, for a rally urging the Legislature to take action. The group also plans to stage a sit-in at the Capitol until lawmakers meet their demands, starting with the passage of several bills that would address the role of money in politics, such as SB 52, which would require political advertisements to display their largest funders." ↑ National Peace Action Coalition (NPAC) and Peoples Coalition for Peace & Justice (PCPJ), Part 1, Hearings, House Internal Security Committee HISC, May 18-21, 1971. ↑ The Communist Party Youth Program: Documents of the Subversive Activities Control Board SACB on Advanceand Burning Issues Youth Organizations, Center for Marxist Education CME, and the Young Workers Liberation League YWLL, House Internal Security Committee, April, 1974, and Fifteenth Report Un-American Activities in California, 1970, Report of the Senate Fact-Finding Subcommittee on Un-American Activities, to the 1970 Regular Session of the California legislature, Sacramento, California. ↑ Revolutionary Activities Directed Toward the Administration of Penal or Correctional Systems, Part 4, Testimony of Richard R. Norusis, Investigator, Minority Staff, Hearings, House Internal Security Committee, July 25, 1973 (in Part), Including Index, HISC, esp. pp. 1749-52, which is her address to the conference. This page was last modified on 21 December 2018, at 22:55.